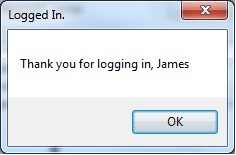 login form will prompt the user for a username and password. default message if the user clicks the OK or Cancel buttons. and 2 in Activity 3-1 for details on this step. Solution Explorer panel and choose the Rename option. Button controls to Form1 in the layout. refer to #7–9 in Activity 2-3). 8. Make sure the application works as intended. path, click on GroceryApp in the Solution Explorer panel.